Body armor is a staple of European armies and most officers or men of means own some form of armor. Armor is little used at sea, and even less so in the tropics. The metal parts require constant care to prevent rust, it restricts movement, inhibits climbing and eliminates any possibility of floating long enough to be rescued if you fall over board. And in the Caribbean it is stinking hot! All that being said it is not uncommon to see some body armor used by pirates and ship crews, but it is only donned in anticipation of immediate combat. Since ship to ship combat can involve hours, in some cases even days, of pursuit and tactical maneuvering to achieve an advantage of wind or position, or just to get close enough to exchange fire, those crew members who own body armor can wait till the last moment before putting it on. 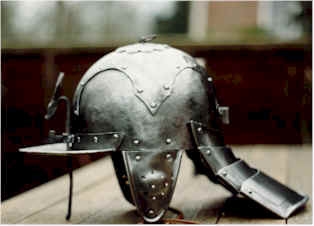 The Morion helmets are the most common types available. 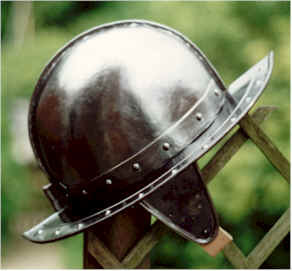 Cabasset is the name of the famous Spanish style Morion helm. 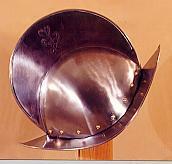 Comb Morion, the style with the tall metal crest. The crest is intended to reinforce the helm and protect the wearer from the downward blow of a sword, axe or halberd. 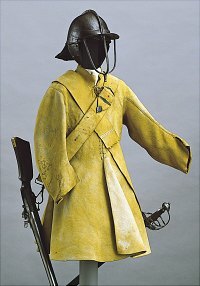 Less common helms are the Birnhelm and Lobster Back helmet, so called because of its articulation. Buff Coats and Buff Vests are the most common body armor. Made of multiple layers of tough leather, reinforced in critical spots, it is designed to protect from cuts and slashes. It will NOT stop a musket or pistol ball! Buff armor varies in length and sleeve cut. 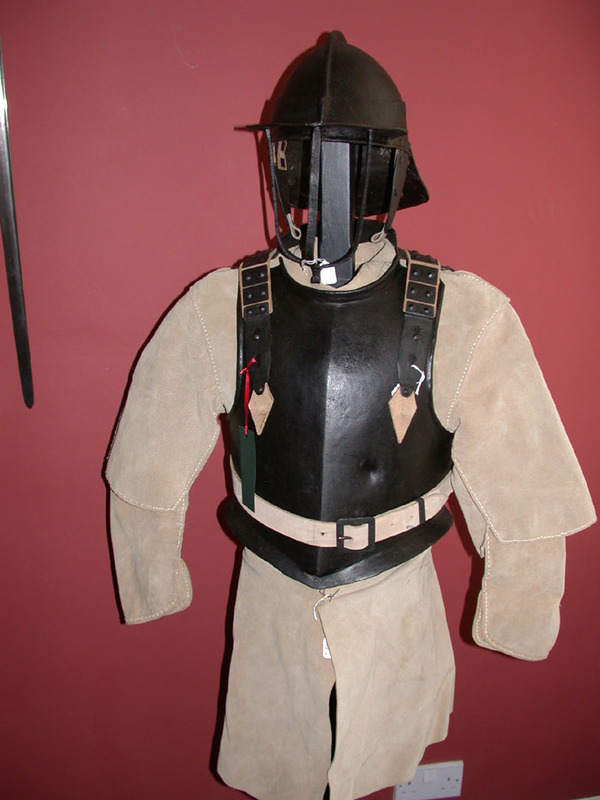 The Cuirass or ‘clamshell’ is a sleeveless piece of metal body armor that protects the torso, both front and back. The breast plate is the front half of a cuirass, without the back plate. Cheaper, lighter and cooler then the full cuirass. A standard breast plate will stop a pistol ball at any distance other then point blank. It will not stop a musket ball. A Proof Tested Breast Plate is a high quality, and expensive, piece of armor that WILL stop a musket ball and has been tested by the armorer to prove it. 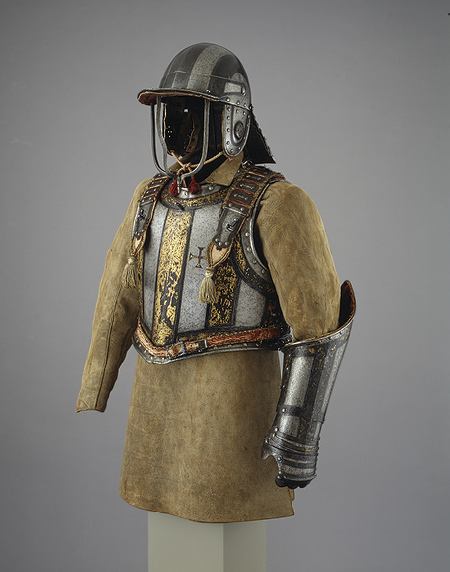 Complete armor with left arm guard. Penetration means to the point of causing injury. Often times the shot will punch a hole through armor but in doing so it looses so much energy that it it virtually harmless to the subject hit.